In Major League Baseball, every team wants to have a dominant closer who can turn a 9 inning game into an 8 inning one. The NFL is a different beast where it is hard for a single player to close out a game, but there are a handful of special players that can decide to dominate at specific times in a game. JJ Watt and Von Miller don’t just have “knack” for coming up big at big moments of games, they work on it and choose to shred offenses when it matters the most. Khalil Mack is on the path to join them. Everyone remembers the final play of the Carolina game etched into their collective memory now, but in that final drive, Mack was doing his fantastic work from the first play. Here are the 6 plays in the final drive. 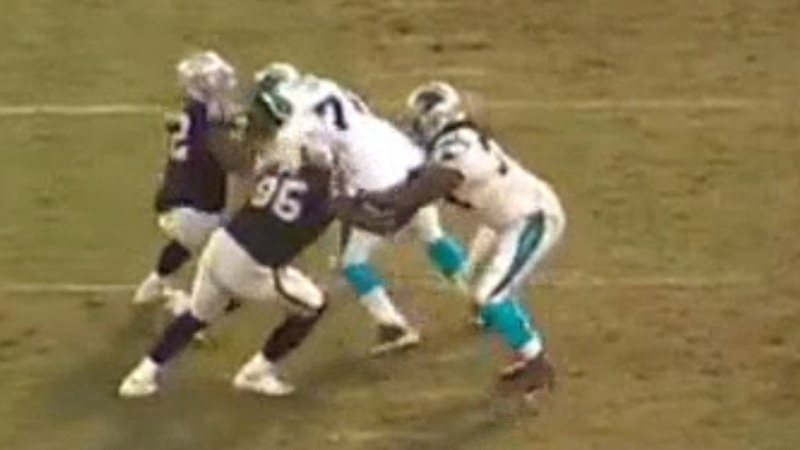 Note that in these plays, Khalil Mack is lined up at the LDE position, opposite the Panthers’ RT. 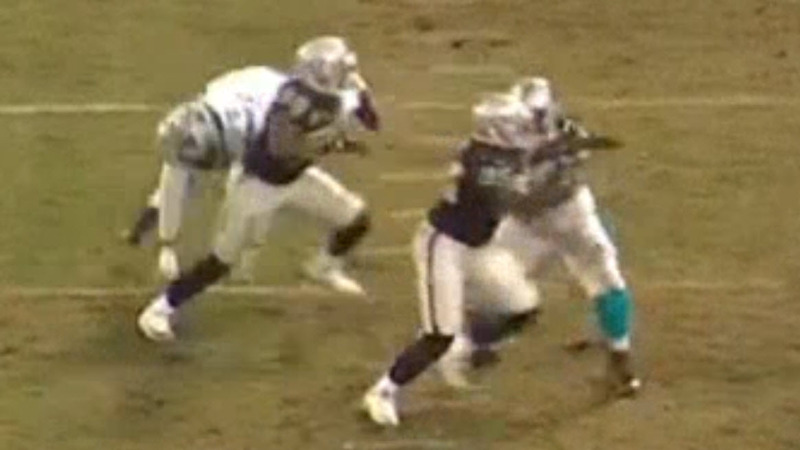 By this time, the War of Attrition had claimed several victims on both sides and for the Panthers’ starting RT Daryl Williams was injured which put RG Trai Turner in the RT position for this crucial final drive. This is a complementary post to the previous one regarding the coverage on the final drive. If you have not read that already, it may be interesting to do so. Note : click on GIFs to get full resolution GFYs; click on images to see full res images. 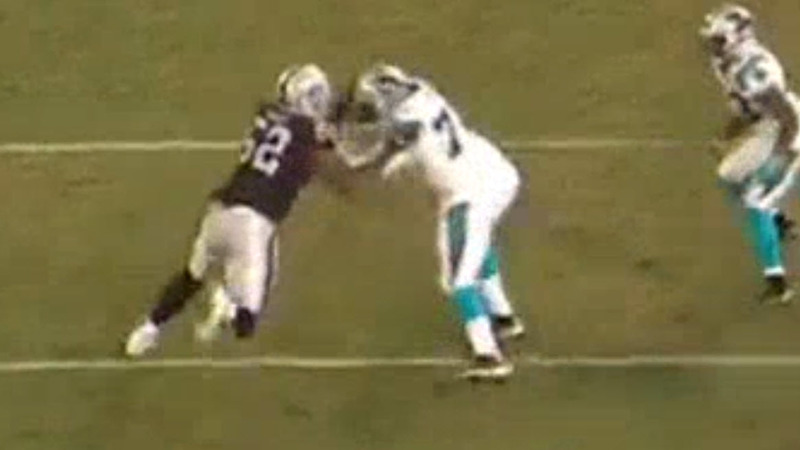 Mack shows speed-to-power rush by taking an outside arc and then charging straight into Turner. They go nose-to-nose. Turner is bracing for the pure power now, but Mack changes it up by setting and torquing. 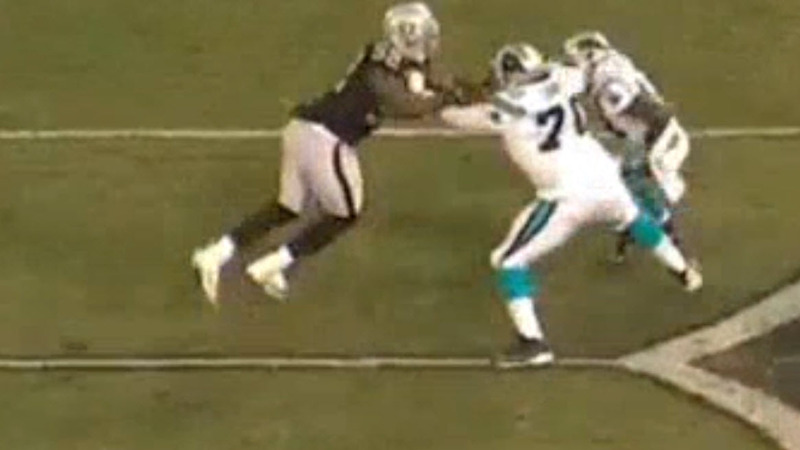 Mack throws Turner upfield like a ragdoll and then charges unimpeded towards Cam Newton. 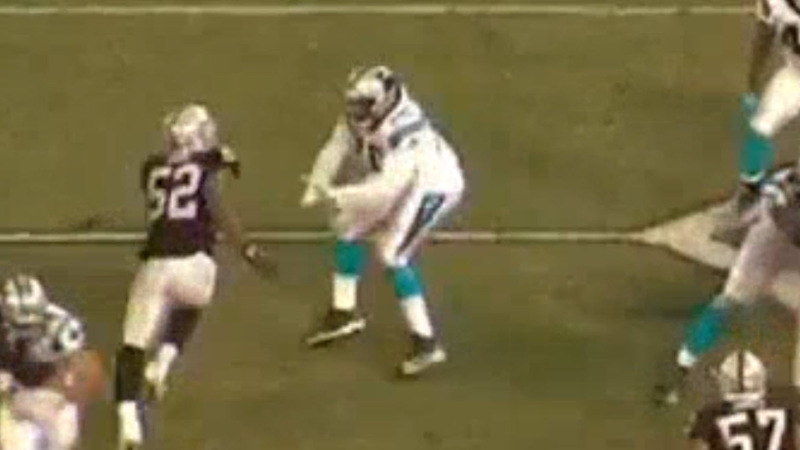 Unfortunately, this takes about 4seconds and Cam Newton gets the ball out (and completed) in 3.8 seconds. Note that on this play, Cory James was blitzing on the Green Dog, which vacated some underneath areas, allowing Cam an easier throw. 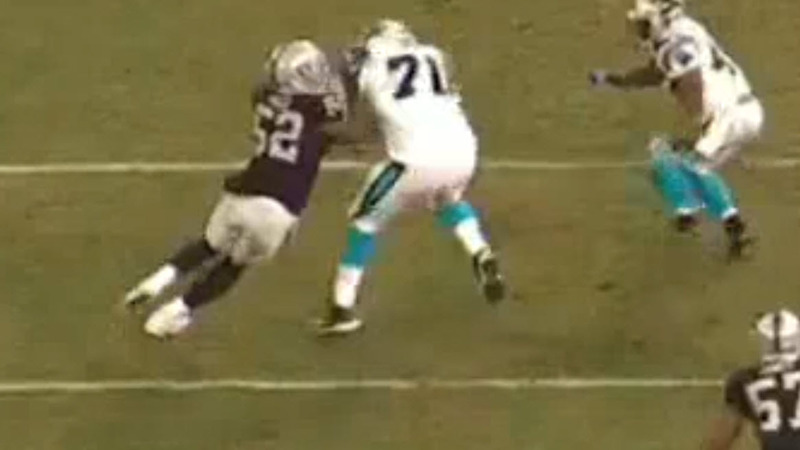 Also, the coverage with Antonio Hamilton was a bit *ahem* messy and allowed Greg Olsen to get free. 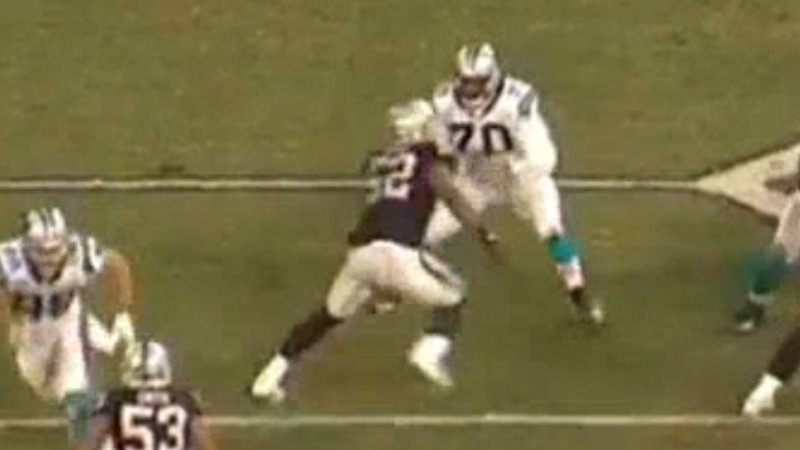 A little better coverage and Mack may have had a sack on this play. Note the perfect hand placement on the outside of the shoulder pads to control Turners shoulders. Fundamental Judo / Leverage concept : If you want to throw a man to the left, first push him to the right. Once Khalil gets that control of Turner’s shoulders, he loads Turner onto his left leg by turning and shoving him backwards. This makes it seems like Mack is trying to clear the outside rush lane. Turner reacts by pushing back upfield and that when Mack torques him by yanking him forward and to the left and flings him aside. 1-10-CAR 45 (1:20) (No Huddle, Shotgun) C.Newton pass short right to D.Funchess pushed ob at OAK 44 for 11 yards (S.Smith). Mack now knows he can dominate Turner, but he also knows that 3.8+ seconds is too long; he needs to get to Cam sooner than that. So he decides to use another move and whip Turner over a full second quicker. This time Mack needed only 2.3 seconds to get to Cam. Unfortunately, for the 2nd straight play, Cam Newton is able to get the ball out before Mack can get there, about 0.1 seconds ahead of Mack. Again, Cory James was rushing the passer on the Green Dog and this time the off-coverage gave an easy throw to Devin Funchess. 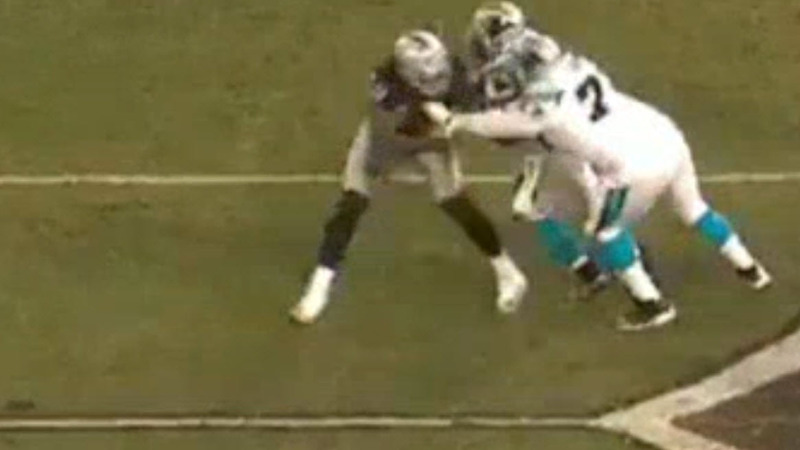 A little underneath coverage to make Cam hold the ball just a tick longer and this could have been another Mack Sack. At this point, Ken Norton Jr must have noticed that Mack was going HAM on the Panthers DL and that the coverage needed to give him just enough time. After this play, Norton called off the Green Dog blitz and instead had another LB (Cory James) dropping into coverage. This is basically Mack’s version of the Club move. He takes the same initial outside rush, but just he’s engaging Turner, instead of powering forward, Mack sets and clubs with his inside arm. That power (combined with perfect hand placement again) turns Turner all the way around so that his numbers are flat to the LOS. 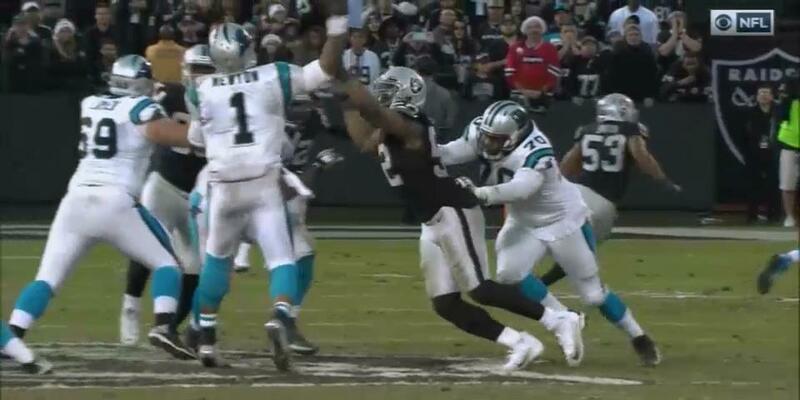 1-10-OAK 44 (1:15) (No Huddle, Shotgun) C.Newton pass incomplete short right to T.Ginn [K.Mack]. 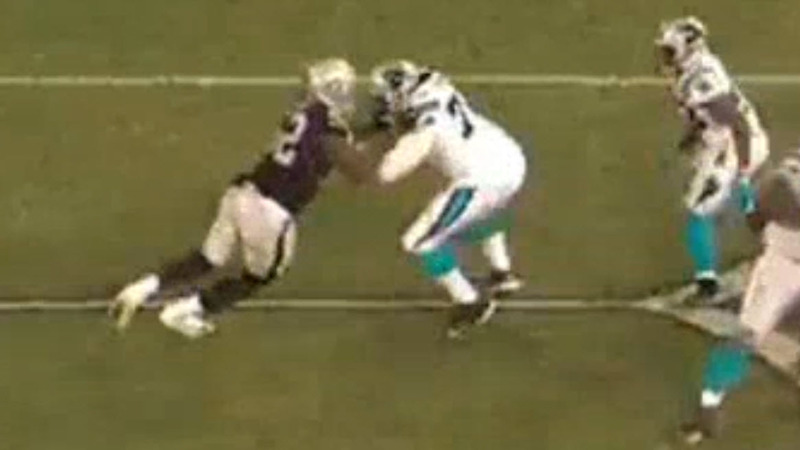 Mack can get to Cam, but needs the coverage to hold up. Now, Ken Norton has called off the Green Dogs and is dropping Cory James into coverage. Having a buzzing LB gives some help and make the receivers work a bit longer to clear defenders. The RB is offset to the opposite side so this ensure that there is no chip coming from the outside. This means Mack has a true 1-on-1 with the outside clear. If he can win the outer edge, he’ll have a clear path to Cam. 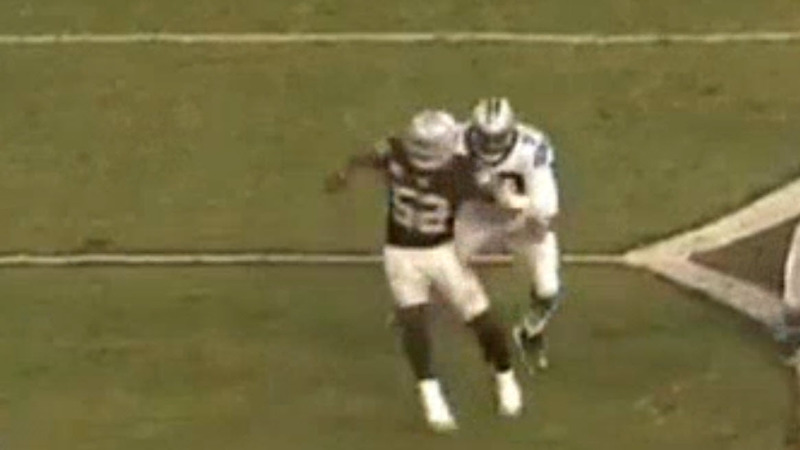 Mack show a hard counter inside move that forces Turner to jump inside. Just as Turner goes to engage Khalil, whoosh, Mack just vanishes as he spins away and upfield. 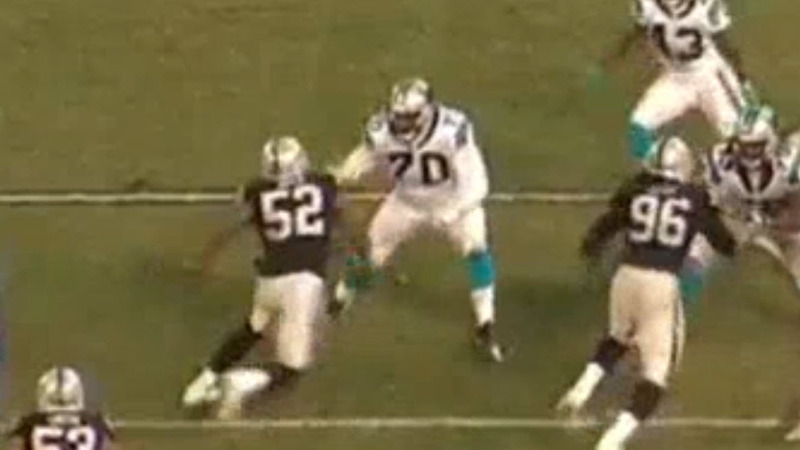 Again, Mack’s left Turner in his wake and is rushing free to Cam. 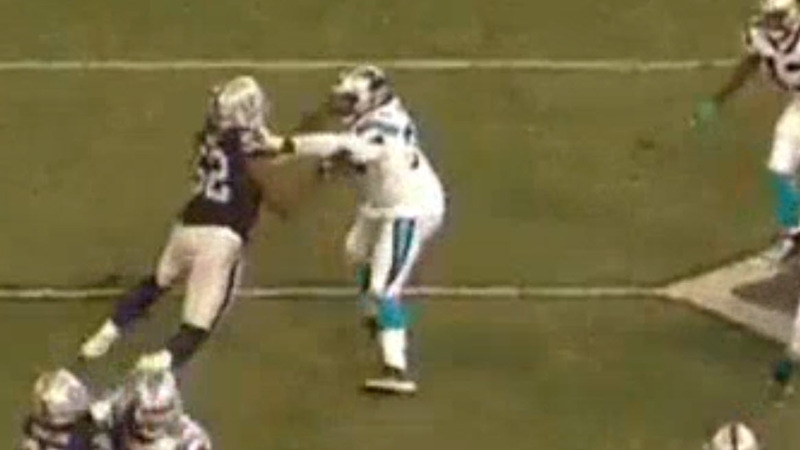 Mack doesn’t get the sack, but he’s able to hit Cam’s arm just as he’s releasing the ball. This is fortunate, because there’s a small window available. 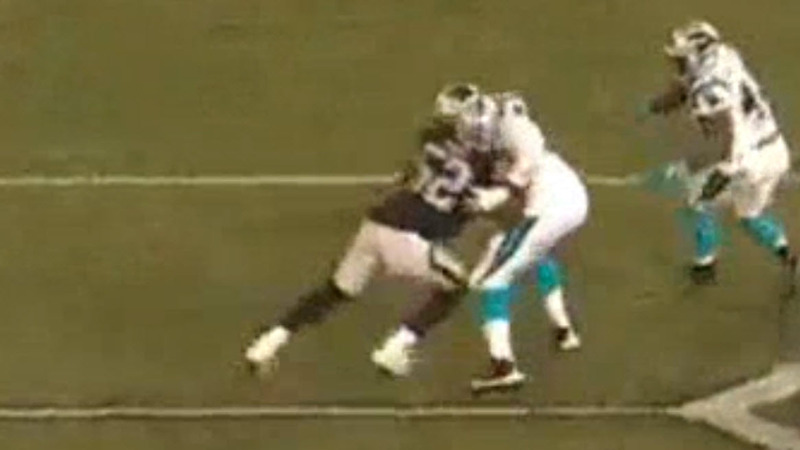 The hit on the arm causes the ball to go into the air and out of bounds. 2-10-OAK 44 (1:10) (Shotgun) C.Newton pass incomplete short right [B.Irvin]. 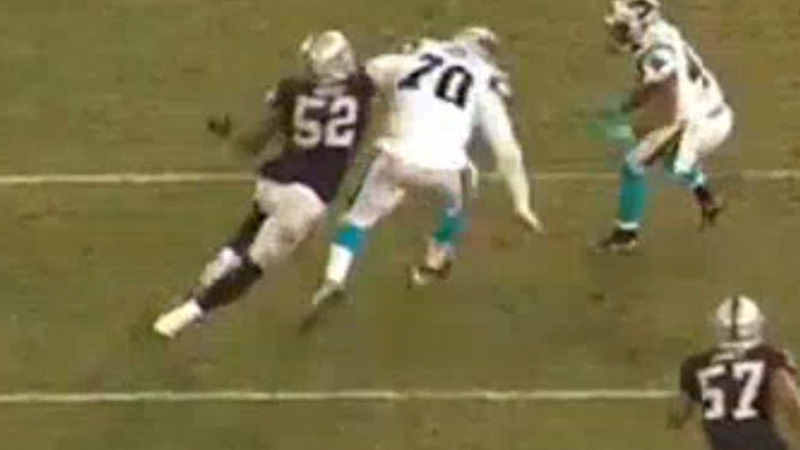 Mack’s first two moves were speed-to-power that he countered inside. 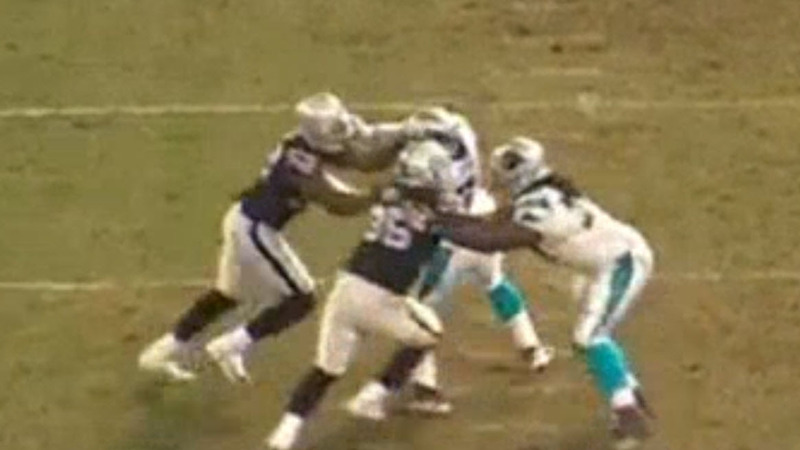 This time, Mack uses the same approach, but works the outside rush lane. However, he doesn’t recognize or realize that the RB Fozzy Whitaker is going to double on him from the outside. Turner gives Mack the outside edge and Whitaker helps out. 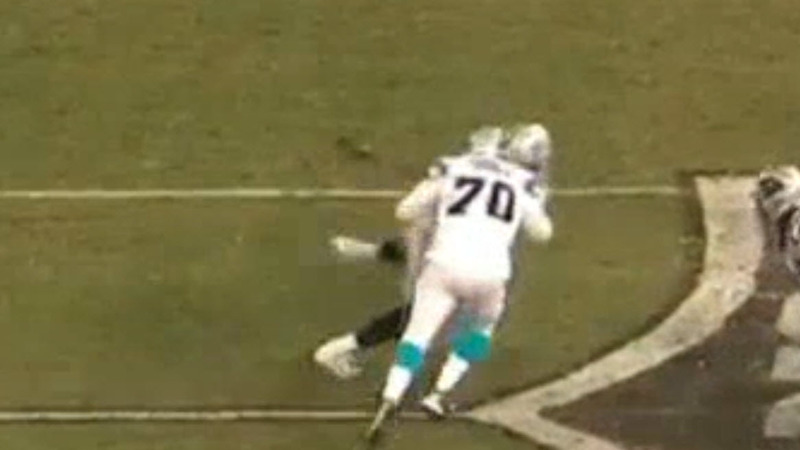 Note this is not a chip block because Whitaker is not going to release after the block. Whitaker is intent on helping Turner keep Mack off Cam. Fortunately, this attention left the interior with 1-on-1s and Jihad Ward made the biggest play of his young career by stutter stepping and breaking up into Cam’s face, causing the disruption in 1.8 seconds. This was huge because TJ Carrie fell down on the deep post and if Cam had the time, he had an easy touchdown throw, possibly a game-winner. 3-10-OAK 44 (1:05) (Shotgun) C.Newton pass incomplete deep middle to G.Olsen. Mack has used the same approach on each of the previous 4 plays and so he feels that he has Turner set up for an inside move now. Mack is hoping to show an upfield first step to get Turner to overplay the outside move and then Dip inside. However, since there is an RB double team, Turner is undersetting and playing the inside. 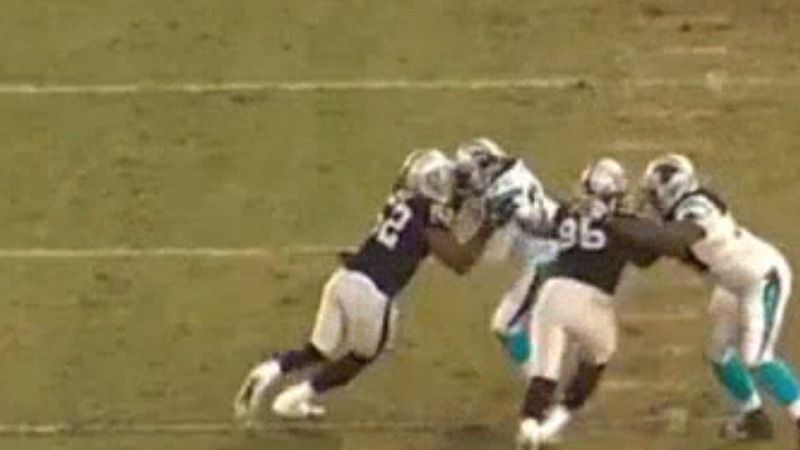 As Mack dips to the inside, Turner is able to engulf Khalil and wash him out past Cam. This gives Cam as much time as he needs with no pressure or even sense of pressure near him. That time and freedom was what Cam needed to make a very nice throw towards Greg Olsen. 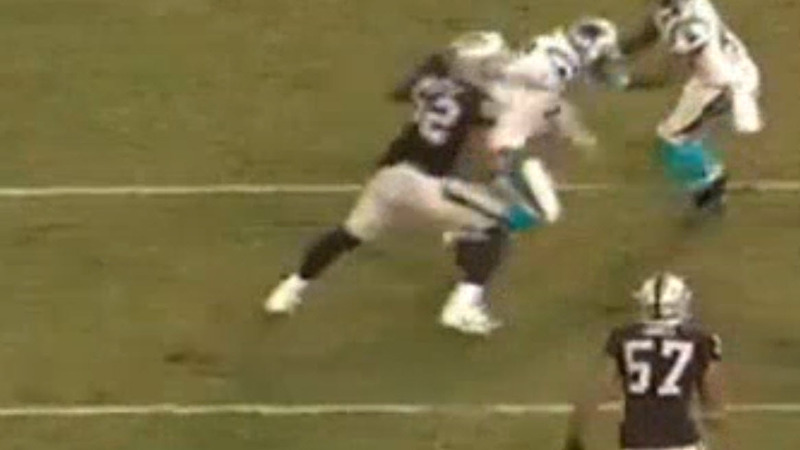 Cam’s throw is just a little bit high and Greg Olsen, at full extension, just can’t bring it in. 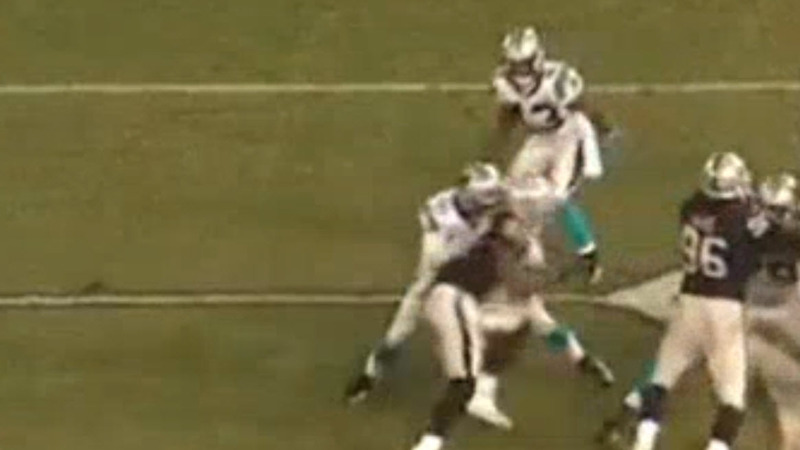 4-10-OAK 44 (1:00) (Shotgun) C.Newton sacked at CAR 47 for -9 yards (K.Mack). FUMBLES (K.Mack) [K.Mack], RECOVERED by OAK-K.Mack at CAR 45. K.Mack to CAR 45 for no gain (C.Scott). There’s not a whole lot to say here that hasn’t already been said. 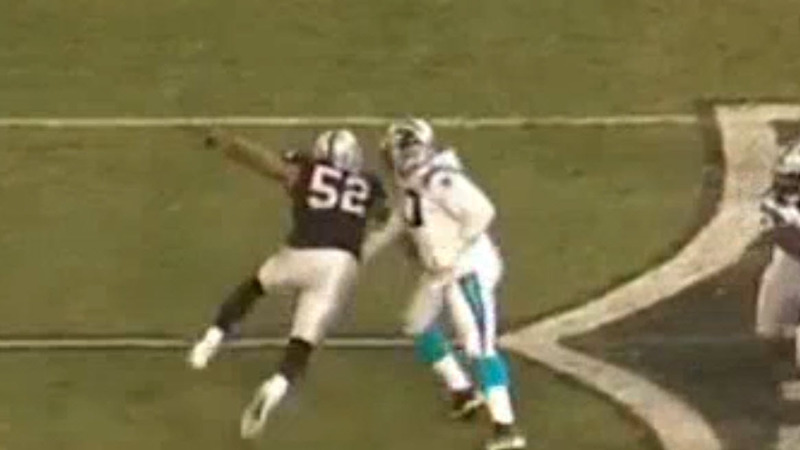 One thing to notice in this iso and the stills is Khalil Mack’s hand-fighting / hand placement. At first glance and at full speed, it appeared that Mack used the One-armed Stab move to move Turner and clear the inside lane. Khalil shows his Speed-to-Power approach. 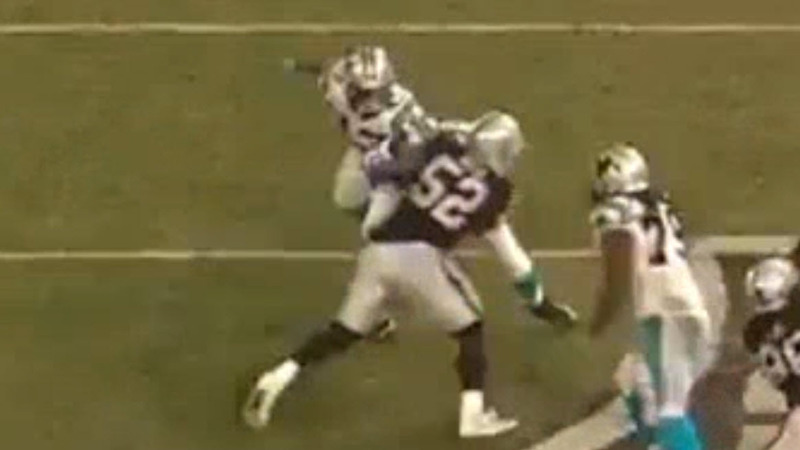 Turner reaches for Mack’s shoulder pad on the engagement and Mack will free himself by striking at Turner’s inside ELBOW. He strikes and lifts Turner’s arm off the shoulder entirely. 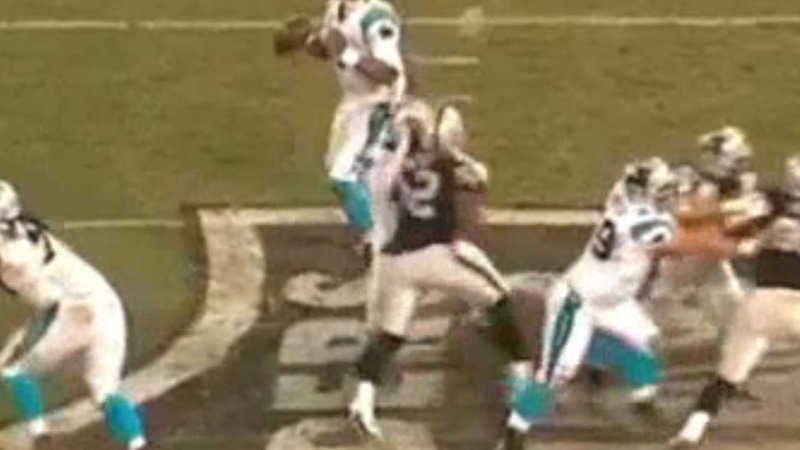 Once Turner’s hands are off Mack, it’s a Win. 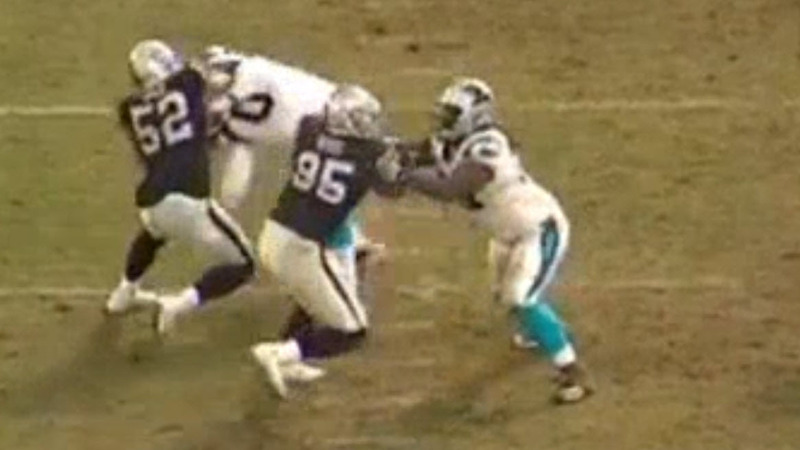 Mack clears inside and explodes towards Cam and the rest is history. There’s an old saying in the NFL, “You make your Name in the regular season; you make your Fame in the post season.” In a similar vein, great players will play their absolute best football at the most important moments of a game. And the 4th quarter is the time when all eyes are on Mack. Khalil Mack is showing that he’s grown up a lot and is now becoming a defensive force that can exert its will at key times. He’s starting to take over games at the end, when it matters the most. He’s making his name. If the team is down one score at the end of the game, we want the ball in Derek Carr’s hands and we know he’ll convert. If the team is up one score at the end of the game and the opponent has the ball, we are growing ever more confident that Khalil Mack will find a means to finish off the game for us. Khalil Mack is a Closer.